But we don’t expect you to take that answer at face value. Instead, consider this—humidity is the excess moisture that comes with high summer temperatures are all too familiar with. This moisture makes us uncomfortable, and essentially the only way it dissipates is by lowering the temperature. So, we turn on our air conditioning in Los Lunas, NM, and set them to the lowest possible temperature, making them work harder and harder as summer progresses. As a result, your air conditioner is strained and accumulates damage. Plus, the humidity isn’t effectively removed, and you’ll still be uncomfortable! Humidity is “too high” when the relative humidity level in your home is above 50% (Conversely, below 30% means your air is too dry, a common wintertime problem). A relative humidity level above 50% is typically when most people notice discomfort. We stay cool by sweating and, more specifically, having that sweat evaporate off of our skin. So when that humidity is too high, there’s too much ambient moisture in the air to enable our bodies to sweat. Therefore, they stay heated and sweat stays on our skin, leaving us feeling gross and sticky when the air is muggy. Additionally, high humidity fosters the growth of mold and bacteria, which can make you sick. The best way to lower humidity, as we mentioned above, is the lower the temperature, causing moisture to coalesce into droplets (much like you’ll notice outdoors on early mornings). This means that your air conditioner essentially serves as a dehumidifier, by default. But there are problems with that. For starters, air conditioners aren’t designed to control the humidity. Yes, they remove some moisture in the air naturally just by running, but it’s not a significant amount and you really have no control over how much moisture is actually being removed. Excess moisture in the air causes your cooling system to work harder than it should have to, in order to do its job of conditioning the air. Since the air feels hotter when humidity levels are too high, you may find yourself setting the thermostat lower and lower. This impacts your air conditioner and subsequently your cooling bills. A whole-house dehumidifier helps with this. Over time, high humidity levels shorten the lifespan of your air conditioner. However, a whole-house dehumidifier is designed to remove excess moisture from your home, without affecting your air conditioner. In fact, the dehumidifier actually helps your air conditioner, since you won’t have to turn the thermostat down as low and in effect, the air conditioner won’t have to work as hard to do its job. 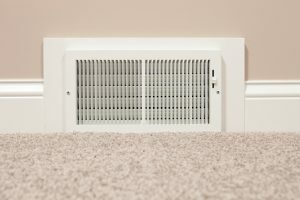 True, most AC systems have a drain pan in order to collect condensation. But excess humidity can easily overflow the pan and create subsequent problems such as mold growth or even fire risk if that moisture reaches electrical components in your home. A whole house dehumidifier, used in combination with your air conditioner, will give you precise control over the relative humidity and the overall comfort of your home, while helping your cooling system operate more efficiently and effectively. Contact Axiom Home Services, Inc. today for reliable HVAC and indoor air quality systems.